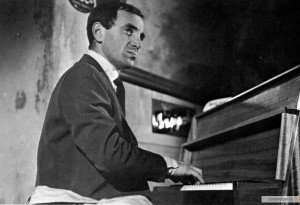 Francois Truffaut’s second and third films reflect the tastes of the French New Wave. So here we have a (very French) film noir based on American pulp fiction that was followed by a period epic that puts two fingers up to the bloated French cinema that preceded it. What can a movie be? After a life spent worshipping at the alter of cinema Truffaut’s answer is clear: Everything. Shoot the Pianist is a no holds barred assault on standard filmmaking. It is, by turns, thrilling, funny, pulpy, tender, tragic, simple, grand, irreverent and romantic. Sometimes these collide so suddenly your head spins – the possibilities are endless, and it all looks effortless. The pianist in question is Charlie Kohler (Charles Aznavour), a bar room piano player who keeps himself to himself. Meanwhile his past is running down the street, pursued by gangsters and about to crash into Charlie’s solitude and force him to confront the man he once was. For Charlie was Edouard Saroyan, a man who broke free from a family of criminals into the big-time as a classical pianist. This feels like a film made on the fly. It’s as if Truffaut felt the success of 400 Blows could die any second so why not go out all guns blazing with this: a scampering tale where fingers must pick between tickling the ivories or the trigger of a gun. What really makes it great cinema is the heart that holds it together. Put simply, Truffaut cares. He cares above all for this talented, elusive, playful, scared little man who is hovering between two identities knowing he is doomed to make the wrong choice. All this in 82 spine-tingling minutes. Sometimes that’s all you need to show what movies can be. When he isn't writing reviews Rob likes to make short films of a surreal nature. His work has screened at the BFI London Film festival and SXSW. His favourite movies include A Matter Of Life And Death and L'Atalante. © 2018 Front Row Reviews. All Rights Reserved.